Star almandite garnet exhibits the optical phenomenon called asterism, a star-like pattern created on the surface of a gemstone when light encounters parallel fibrous, or needle-like, inclusions within its crystal structure. Light that strikes the inclusions within the gem reflects off of the inclusions, creating a narrow band of light. When two or more intersecting bands appear, a star pattern is formed. Depending on the crystal, the star may have four, six, or even twelve rays. When only one band forms, it is classified as a "cat's eye". Appearance, refractive index, SR nature, spectrum, SG. Color is also helpful. Stones with SG lower than 3.8 and a RI lower than 1.76 are pyrope and those with higher almandine. 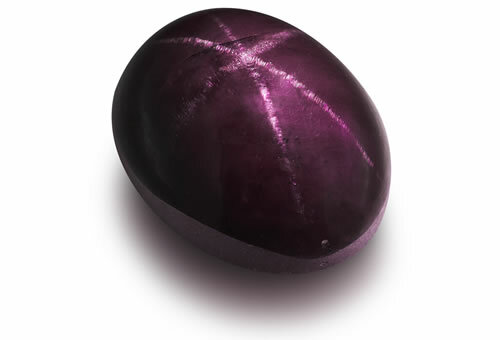 Almandite garnet is a type II clarity stone. Displays 4 or 6 rayed stars and sometimes well cut stones will show both. Stones are often found with needles that intersect at 70o to 110o angles. Zircon crystals are commonly seen with strain halos. Irregular or rounded crystals can also be found.